Congratulations – you found Australia’s only ‘Results Guaranteed’ team building experiences of any kind. 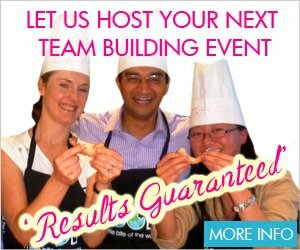 Enquire now and we’ll show you how easy it can be to create a “best ever” team building event: fulfil your objectives and have brilliant fun and a great meal all at the same time. Whether you ‘just’ want to have fun, need to incentivise sales or build key relationships among your team or clients, … whatever your objectives, we guarantee to achieve them or your money back. VictorsFood cooking team building activities add heat to your event. You and your guests have a great time cooking and eating together, and bond like never before under our expert care.